Makin' it in Memphis: Blading. I mentioned that Ellen's birthday was Thursday. Friday night we had a ridiculously fun 80's themed skate party at Cordova Skating Rink. Elise hosted the party for Elle and all our favorite people were there. I decided to go Risky Business on the theme and took one of Jake's button ups and paired it with black leggings. 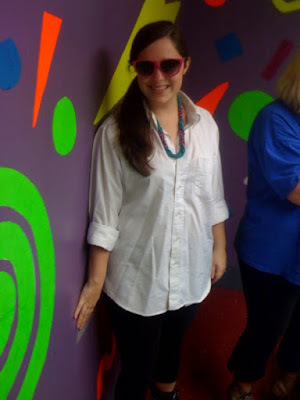 I accessorized with hot pink sunglasses (at night) and an authentically 80's beaded necklace of my mom's. My blades. I got these in middle school and apparently my feet haven't grown since then. So last night I may have been the only one rolling into a 24 year old's birthday party at the Skate Center with my own blades but I was sure happy when I was whizzing by on the rink. What a fun night! Skating, 80's gear.... AND a Muddy's birthday cake. Happy Birthday, Ellen!! if blogger had a "like" button, i would like this post 101 times. I LOVE BLADING. my friend katie and i used to go bladin' at shelby farms all the time in high school and college! 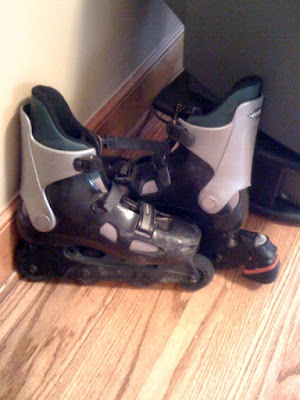 i still have my blades too!